One week into 2018 and markets have already been taken by surprise. 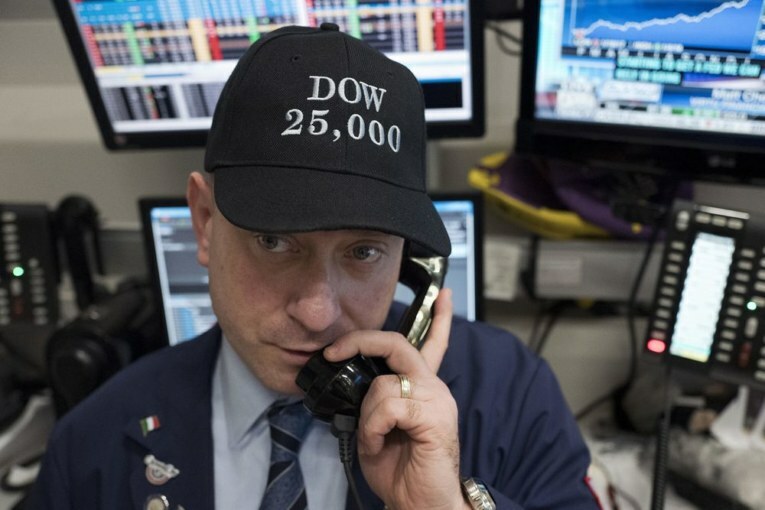 Whether it’s the limited response to the frigid temperatures that have gripped much of the continent, oil prices breaking US$61 a barrel, the Dow Jones Industrial Average and Nasdaq reaching new highs or Bitcoin trading well below its record price, investors are re-thinking what’s ahead for 2018. From a macro perspective, several key areas bear watching. The first is global economic growth and whether the synchronous growth of 2017 will continue. Lost in the focus on stock market valuations was the fact the global economy was expanding at the same time, though not at the same rate. Still, the relative strength translated into stronger corporate profits, business investment and stock market values. It also underpinned demand for oil, which grew by 1.6 million barrels a day in 2017 and is one reason for the commodity’s stronger performance, in addition to production cuts instituted by the Organization of Petroleum Exporting Countries and Russia remaining in place throughout the year. Global growth in 2018 is forecast to be between 3 and 3.8 per cent, depending on the forecast. It might be categorized as a Goldilocks scenario: not too hot, not too cold — just right. Major global economies are in different stages of the business cycle, which means the risk of an overheated economy is minimal. It also suggests double-digit returns posted by many stock markets in 2017 are unlikely to be repeated. Most surprising, perhaps, are the high expectations for growth in the eurozone — despite the uncertainty surrounding Brexit, a spate of European elections on the horizon this year and Japan, which is emerging from a profound deflationary period. There are also assumptions regarding the rate of corporate investment, mergers and acquisitions, the reaction to global economies of central bank deleveraging and rising interest rates. One emerging theme is that 2018 could mark a shift from consumer-driven economic growth to growth that is driven by corporate investment in the form of capital expenditures. The rate of corporate re-investment has been at historical lows in recent years. Whether tax reform and profit repatriation will be the catalyst for corporations to re-invest remains an unanswered question. Investment decisions that boost productivity could help extend the U.S. business cycle and be a moderating factor in what could be an inflationary environment as the labour market gets tighter. While that country’s economy is in the later stages of a business cycle, expectations are it will grow at a rate of about 6.5 per cent. It, too, is set to benefit from increased corporate expenditures, as well as a growing middle class and pent-up consumer demand. When it comes to crude oil, two factors merit mention — the recent protests in Iran, which could have destabilizing effect in the Middle East and cause oil prices to rise, and investment in the energy sector. Toward the end of 2017, the Wall Street Journal noted institutional investors wanted to see shale players focus on growing profitability rather than production volumes. This suggests some moderation in U.S. shale production, even as the oil price strengthens. The shale plays require a steady stream of capital from investors because most companies outspend their cash flow. According to data released late last year, U.S. companies active in the shale plays tapped the debt market to the tune of US$60 billion last year — the most since 2014. The question for 2018 is whether the appetite for that kind of activity still exists. But 2018 will also be a bifurcated market for the energy sector, as natural gas players struggle with low prices that even the frigid continental cold snap could not eliminate. Even with storage numbers almost six per cent below five-year averages, record draws in recent weeks have not been enough to boost prices. The 12-month forward strip for natural gas in the U.S. remains below US$2.90 per million British Thermal Units and at a miserable C$1.65 per thousand cubic feet at the AECO hub. The only way out is through increased exports of liquefied natural gas, substitution for coal to generate electricity and manufacturing inputs. This suggests tougher times for Canadian natural gas players, with a high likelihood of consolidation as a way to capture synergies and decrease costs. Canada’s economy will benefit from the strength in the U.S. but also from a stronger energy sector, continued private sector investment and ongoing infrastructure investments on the part of governments across the country. RBC Capital Markets is forecasting the Canadian economy to grow at 2.9 per cent — with the first half of the year posting stronger gains. The greatest uncertainty for Canada could relate to NAFTA negotiations. As 2017 drew to a close there remained a distinct possibility the U.S. would give its six-month notice to abandon the agreement. If that happens, experts have said trade between Canada and the U.S. would revert to being governed by the original Free Trade Agreement. There is also the probability any such move would be challenged in court. That said, looming mid-term elections could render the NAFTA withdrawal threats moot should Republicans lose control of either the House of Representatives or Senate in November. Canada is set for higher interest rates in 2018 as the labour market tightens and the Bank of Canada seeks to keep inflation under its 2 per cent target. RBC is looking for rates in Canada to end the year at 1.75 per cent, up from 1 per cent in 2017, while expectations are for the U.S. Federal reserve to boost rates to 2.5 per cent by the end of 2018. Despite all the good news and positive momentum, it’s tough for Albertans to share the optimism reflected in many of the 2018 forecasts. While there is an overwhelming sense the province is on its way to solid growth, with 2018 set to be a year of rebuilding and stabilization, the provincial economy is still weighted to oil and natural gas. With the continued lack of certainty regarding pipelines and access to new markets, it’s hard to be optimistic about Alberta’s prospects. Yet it’s important to look beyond energy and to skills applicable outside the sector — be they in engineering, finance or technology — and to other sectors, such as manufacturing, tourism and agriculture. If employment numbers released Friday — which showed the unemployment rate dropping to 6.9 per cent in the province and to 7.2 per cent in Calgary — are any indication, the economy is definitely beyond recovery. Depending on the forecast, Alberta’s economy is expected to grow between 2.3 per cent and 2.5 per cent in 2018, accompanied by a drop in unemployment and an increase in wage growth. What’s interesting is that none of the forecasts are focused on the impact of the higher minimum wage rate, which increases to $15 later in October, or the higher carbon tax. That suggests these factors are not going to have the negative economic impact that some think they will. Pull all of the many factors together and 2018 — barring significant political upheaval is shaping up to be very positive from an economic standpoint — all the way from the province to the globe. And that Bitcoin thing? It’s shaping up to be nothing more than a distraction.